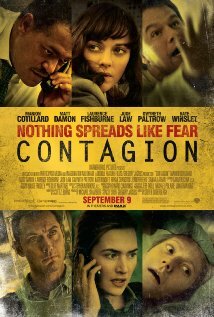 I’ve delayed reading the reviews for the new film Contagion until I sort though my feelings. When I worked at the CDC my colleagues didn’t suit up in the Day-Glo orange hazard gear but they did venture to outbreaks to figure out how and why diseases spread. And none of my friends perished working on an outbreak. The movie is centered around a handful of individuals with whom we travel on their journeys when a deadly and mysterious bug begins killing people. The story trajectory is about discovery in a medical context: we follow the scientists who are intent on figuring out the history and composition of the bug, and how to create a vaccine to armor its hosts. We also learn a lot about communication: the heart of my work. The story borrows from well-worn narratives of discovery by showing a scientist testing the vaccine on herself before saving the human race. But we never find out the mechanics of how the vaccine works. We learn a little about most of the characters, but not quite enough to get too attached. We learn just enough about the scientist to see why she loves medicine and we see the underbelly of the journalist-blogger who spreads lies. The film is a bit like the CSI stories on television, where we see the visual overlays of blood circulating and chemicals linking. We even get to see part of an autopsy you won’t soon forget. The film makes the boring details of science picturesque but fails to engage us in the characters. I want to fall in love with the protagonists and despise the antagonists. But, after the credits began to roll, I stopped caring. This entry was posted in cinema, ethics, film, framing, health, journalism, risk, science, science communication, writing and tagged literacy, rhetoric, science. Bookmark the permalink.